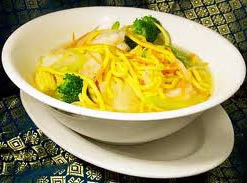 Bring a large pot of water to boil add the noodle and cook until tender for 8-10 minutes. Put Stock in a wok add ginger and garlic to it saute it for 2 minutes add mushroom, onion add the broth soy sauce and chili paste bring to boil. Add the tofu, pokchoy, adjust the seasoning and cooked noodle and coriander. Stir to mix and serve hot.